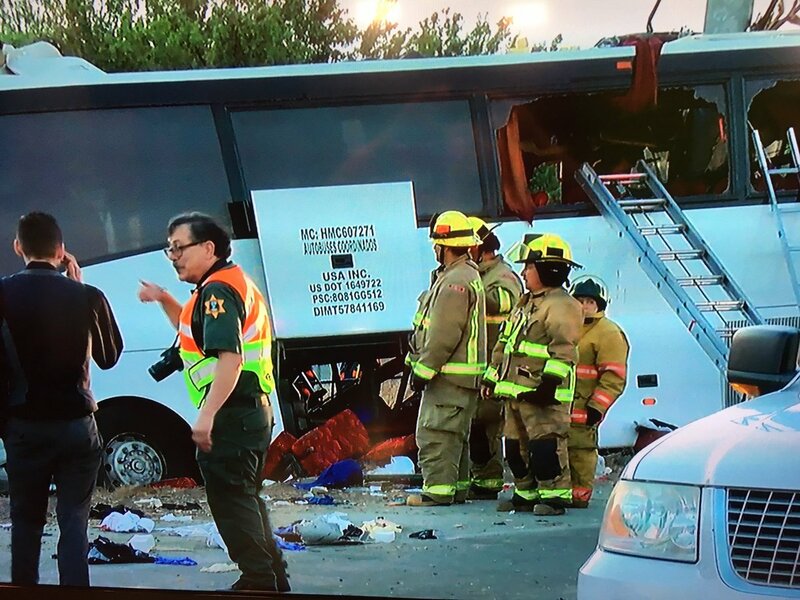 MERCED, California -- A tour bus crashed into a pole on a Central California highway, leaving at least five people dead and a gruesome scene for rescuers, officials said Tuesday. CBS Fresno affiliate KGPE-TV reports the accident occurred on Highway 99 near the Liberty Avenue exit and the town of Livingston just after 3 a.m. local time. CBS Sacramento reports the bus started in Mexico, stopped in Los Angeles on Monday night and was on its way to the Sacramento area on Tuesday. Its eventual destination was Washington state, California Highway Patrol officials said. A California sheriff said several injured passengers lost limbs when the speeding bus veered off the highway and struck a pole. Merced County Sheriff Vern Warnke told The Associated Press that the bus hit the pole of a highway sign head-on early Tuesday, and it sheared through the vehicle before stopping at the first axle "with a great impact." Warnke said rescuers brought out "bags of body parts" from the survivors following the crash. The sheriff said the bus operated by Autobuses Coordinados USA was due in Livingston at 1:30 a.m. to change drivers. In addition to the five killed in the crash, at least other five people, some in grave condition, have been transported to the hospital. The violent collision woke up Leonardo Sanchez, who found himself in chaos: Fellow passengers were screaming and crying. Some couldn't move, and many were calling out for help, he said. "We couldn't pull people out because there was shattered glass everywhere, seats destroyed," the Arvin, California, resident said. The bus driver, identified by CHP as 57-year-old Mario David Vasquez, suffered major injuries in the crash. One of the survivors of the crash says the bus appeared to be trying to pass another vehicle that wouldn't let it in just before it veered off the highway and slammed into the pole. "That vehicle wasn't allowing him to pass and it kind of ran him off the road," Nakia Coleman of Pasco, Washington, told Washington's Tri-City Herald newspaper. California Highway Patrol Officer Moises Onsurez says the bus suddenly turned sharply off the highway before the crash. He says investigators are still trying to determine why. Onsurez added that investigators haven't been able to interview the driver yet because of his injuries. The Federal Motor Carrier Safety Administration listed the carrier as having a "satisfactory" rating as of May 17. The bus was inspected in April and had three violations, including a lack of or a defective brake warning device. That violation was not further described, and there was no indication whether each of the items had been fixed. Some highway signs, like those listing the speed limit, have support poles designed with points that break away during a crash. But the poles supporting the much larger overhead signs are designed to "stay put," said Vanessa Wiseman, a spokeswoman for the state Department of Transportation. She said the pole involved in Tuesday's crash had the required barrier -- in this case, a guardrail -- on the side facing lanes. The northbound section of the highway has been shut down as officials investigate. The stretch of road is expected to stay closed until 7:30 a.m. or later.